It's official. Michigan will play Notre Dame in primetime on September 7, 2013. Also, Tom Harmon, Old 98, will be honored as a Michigan Football legend. Maybe it's just me, but 2013 is already starting to have a special feel to it. This game will be huge. 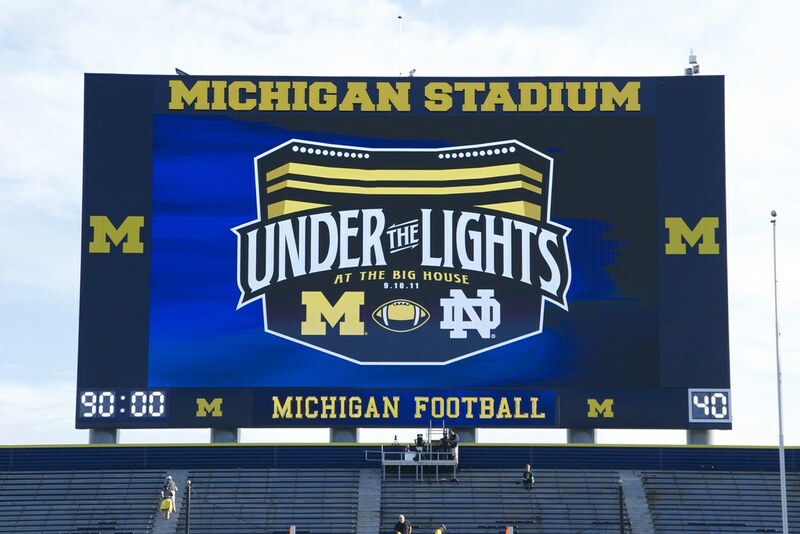 Ann Arbor, Mich. – The University of Michigan football team will face the University of Notre Dame in a nationally-televised primetime game at Michigan Stadium, it was announced Tuesday (Dec. 11) in a joint announcement with ESPN. The athletic department will honor 1940 Heisman Trophy winner Tom Harmon, installing him as a Michigan Football Legend during a pre-game ceremony. The actual game time and ABC/ESPN platform for the Sept. 7, 2013 contest will be announced at a later date. This will be the third consecutive night game played between the winningest programs in college football history. This will be the second-ever night game played at the Big House. The first came against the Irish in 2011, a 35-31 victory by the Wolverines on a 16-yard touchdown pass from Denard Robinson to Roy Roundtree with two seconds left in regulation. Michigan Athletics kicked off its Legends program with the honoring of 1991 Heisman Trophy winner Desmond Howard during that inaugural night game in school history. Tom Harmon is regarded as one of the greatest athletes in school history. During his three seasons with the Maize and Blue, he rushed for 2,134 yards, scored 33 touchdowns and threw 16 touchdown passes. Harmon added 33 PATs and booted two field goals to his 33 TDs for 237 career points. After a four-year stint as a pilot during World War II, in which he won a Silver Star and the Purple Heart, Harmon married actress Elyse Knox and played for the Los Angeles Rams in 1946 and 1947. He became one of the nation's top sports broadcasters and directors, reporting live on major sporting events from the Olympics to the Rose Bowl. In addition to Howard (#21), U-M has honored Bennie Oosterbaan (#47), Gerald Ford (#48), Ron Kramer (#87) and the famed Wistert Brothers – Albert, Alvin and Francis (#11). A permanent patch is affixed to the upper left chest of the game and practice jerseys of all future players that receive the honor of donning the Michigan Football Legends number. Each of the legends will be featured in a special area to be designed and constructed in the soon-to-be renovated Schembechler Hall. The lockers to be used in both Schembechler Hall and Michigan Stadium are customized to reflect the fact that those players will forever by recognized as Michigan Football Legends. This will be the final meeting between Michigan and Notre Dame at Michigan Stadium for the foreseeable future. The Wolverines lead the series between the two rivals, 13-7, in Ann Arbor. Michigan has won six of its last seven games against Notre Dame in Ann Arbor, including two 38-0 routs in 2007 and 2003. The Wolverines lead the all-time series, 23-16-1. Michigan Athletics will have additional announcements forthcoming about special activities around the night game with Notre Dame.